From the moment I initially visited the SnoreDoc website, I loved everything about this device. The design is simple. It has an airflow hole, and it uses the boil-and-bite method to achieve a custom fit. Plus, it retails at $39.99. What’s not to love? This is one I could not wait to try. 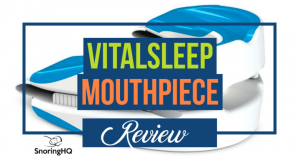 Well, I finally understand that old saying, “If something seems too good to be true, it probably is.” Unfortunately, this snoring mouthpiece did not make my list of favorites. It didn’t even make the list of mouthpieces that I sort of like. 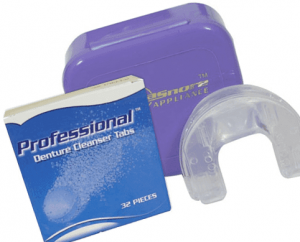 There are so many other good anti snoring devices to choose from. Backed by a 30-day money back guarantee. Retails at $39.99, which makes it one of the least expensive MADs on the market. Boil-and-bite technique does allow you to achieve a custom fit. Features a front airflow hole to allow for mouth breathing. Soft rubber texture is non-irritating to the gums and lips. Simple design makes it easy to clean. Company is accredited by the Better Business Bureau. Does not allow for any adjustments of the lower jaw position. Airflow hole is very small and would be challenging for a mouth breather to rely on every might. The small hole also creates a whistling sound when air passes through, which may not be a big deal to you while you are sleeping, but a partner might find this just as disturbing as the actual snoring. Substantially bulkier than many other MADs, which means increased soreness and difficulty falling asleep. The price is low on SnoreDoc, but unfortunately I think the price reflects the quality. I didn't find this mouthpiece comfortable and find it difficult to breathe easily. A good attempt, and good for a budget shopper, but ultimately I don't recommend SnoreDoc. 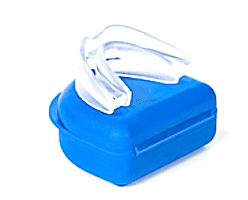 SnoreDoc is a mandibular advancement device (MAD) that is designed to hold your lower jaw forward while you sleep. This opens your airway to keep it free of obstruction, which eliminates the vibration of soft tissue. When vibration of tissues is eliminated there is no snoring. Plus, you don’t just get rid of that obnoxious sound; you also enjoy better sleep quality and improved health. MADs are great. I have tried and reviewed many, and really liked several, but the one thing I have definitely learned is that they are not all the same. SnoreDoc is made of a small thermoplastic material that actually feels like soft rubber. It is not irritating against your gums or lips at all. It has a simple design, and it does not have any screws or other pieces that tend to make cleaning more difficult. Plus, it can be custom-fitted in the privacy of your own home. It is a one-size-fits-all device, and it can be easily cleaned with soap and water. The model that I tried was clear and had one small airflow hole, which I will complain about in a minute. However, on the site there is a picture of a blue model now that has two airflow holes. It is hard to tell which one you are going to get since there are pictures of both devices on the site, but only one order form. If you are a mouth breather, you will want to make sure that the blue model is actually the one you will be receiving. SnoreDoc does come with a 30-day money-back guarantee. It is manufactured by Pearl Enterprise LLC, and cleared by the United States Food and Drug Administration. When my SnoreDoc mouthpieces arrived (one was for my wife), I actually thought that I had been sent the wrong device. In the picture on the website it looks quite small, but this is definitely not a petite mouthpiece. It is substantially bulkier than many other MADs I have tried. I cleaned them, and then we did the boil-and-bite technique. The fitting process was simple, but it did not help with the bulkiness. My wife was already complaining. It was going to be a long week. The first night, we both had a hard time falling asleep. I was drooling a lot more than usual, and my wife ended up taking her device out and tossing (hurling) it on the nightstand (across the room). The size of it was creating a gag reflex. She just could not deal with it. I am significantly larger than her, so I wasn’t having this problem. I woke up the first morning after pressing the snooze button several times. I was so tired. Clearly, I had not slept well, but my device did fall out in the middle of the night, which explains a lot. I didn’t even have to ask my wife if she was going to try the second night. I already knew the answer. There was no point getting the “eye” or a smart response by asking. Things went from bad to worse the second night. My wife actually woke me because she couldn’t deal with the whistling noise. The breathing hole is so small that the air pushing through was creating a whistling noise. I’m usually not a mouth breather, but I had been working in the yard all day and my allergies were starting to get to me. I was determined to get through a full night wearing this device though. As my reward for accomplishing my goal, my jaw was incredibly sore. SnoreDoc’s size was definitely working against me. By the third night, my allergies were really flared. I couldn’t breathe through my nose at all. Unfortunately, I also found that the tiny air hole was not nearly large enough to rely on to breathe through my mouth. This is why I said that if you are a mouth breather to make sure you are not getting the clear one. The blue one “looks” like the holes are a lot bigger, but then again, looks can be deceiving. I ended up pausing my trial until my allergies cleared up, and the restarted again. It did stop my snoring, but I can’t say the comfort level increased with use. This is not one I would be able to wear full time. Although I didn’t personally care for SnoreDoc it does have some positive qualities. It is important to become familiar with the pros and cons of a product when making a purchasing decision. If you are looking for a very budget-friendly option then the $39.99 price tag may make this option very attractive to you. However, a good price is really just a waste of money if you are not going to be able to get any use out of it. SnoreDoc is considerably bulkier than many other MADs that may be more money, but they are effective and more comfortable. The SnoreDoc website says it is made from a thermoplastic material, but there is no mention of it being BPA- or latex-free. I would recommend trying ZQuiet or Zyppah instead. It does cost $40 more, but you can order it and only pay $9.95 shipping upfront, and then your card won’t be charged the full amount for 35 days. If you want to try a tongue stabilizing device (TSD) instead of an MAD, I recommend Good Morning Snore Solution. 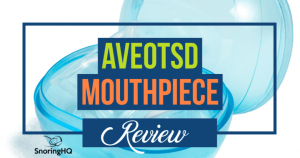 You may even want to consider My Snoring Solution, which is not a mouthpiece, but still an effective stop snoring product. These are sold on ebay for less than $10.